I am a sucker for braised “fall off the bone” ribs, so here is one of my favorite ways to make beef short ribs. 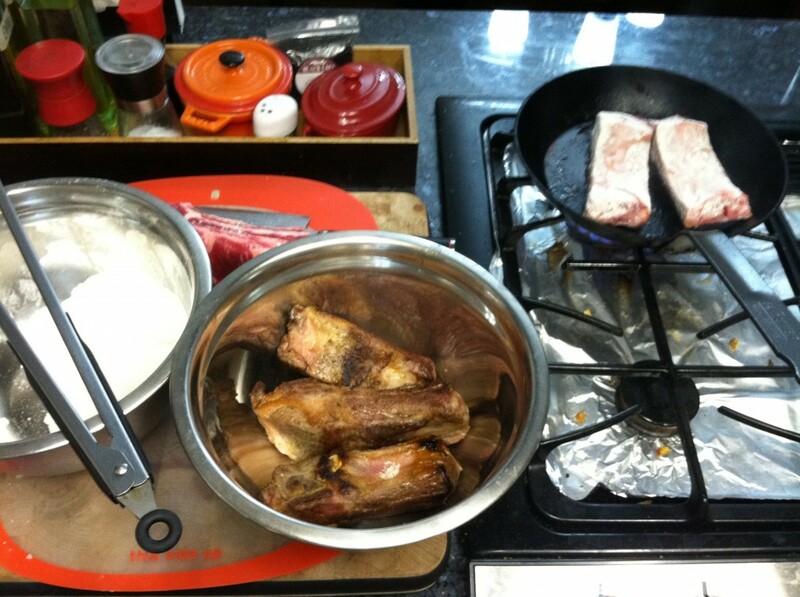 This is a two day cooking process, total time needed to prepare the dish is only about 30 minutes. Next you want to coat your ribs with a light layer of seasoned flour (Baking flour with a little salt). 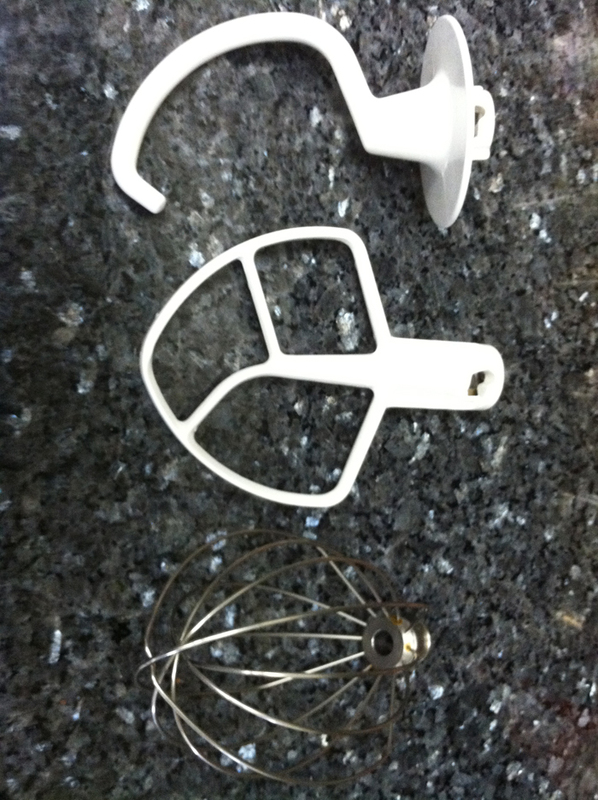 Just coat it in a bowl then make sure to shake off the access flour. Bring a heavy pan (cast iron would be ideal) to high heat and add some cooking oil. Then sear your ribs to form a nice brown crust on all sides. 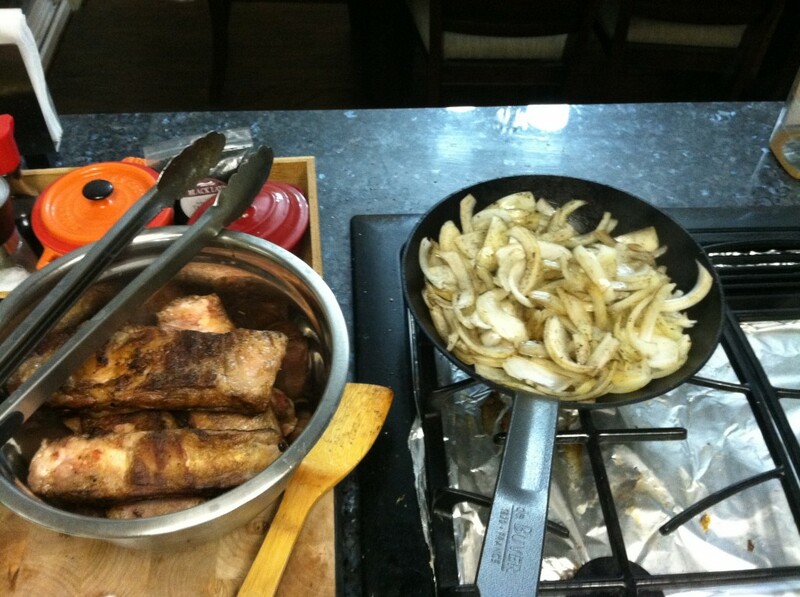 Remove the ribs once they are seared and place them into a bowl and set them aside. Once all of your ribs are seared let them rest in a bowl and on the same pan add more oil and cook two onions (julienne the onion, to julienne an onion just cut off 1/4 inch from the top and bottom then let the onion site on one of the two flat sides. Now cut the onion in half vertically. Once cut in half, lay the newly exposed flat side of the onion onto the chopping board. In other words the middle of the onion should be facing the board. Now cut the onion into 1/4 inch strips from top to bottom. You will end up with 2 – 3 inch strips, this is the cut known as julienne). Cook your onions just long enough for them to get soft, do not over cook because they will finish cooking in a slow cooker. Once the onions soften up a bit and absorb the flavor from the pan, pour them into a slow cooker and add the ribs on top of the onions. The next step is to make your braising liquid. 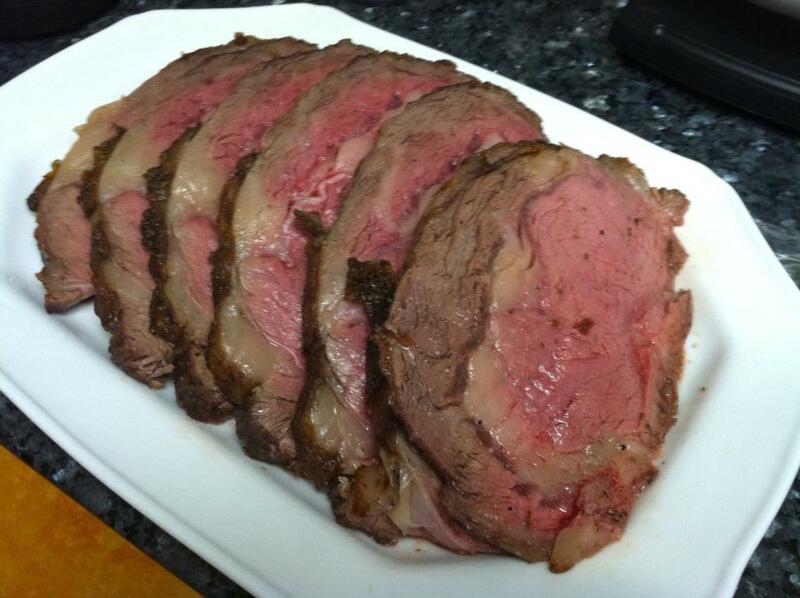 Whenever you braise you want a flavorful liquid that will taste like a sauce after it is down cooking. So lets think through what is needed in a braising liquid. The meat (beef ribs in this case) is going to add beef flavor and fat (oil). So whatever liquid you use needs to have a little bit of acidity to cut through the fat (or else your sauce will taste greasy). 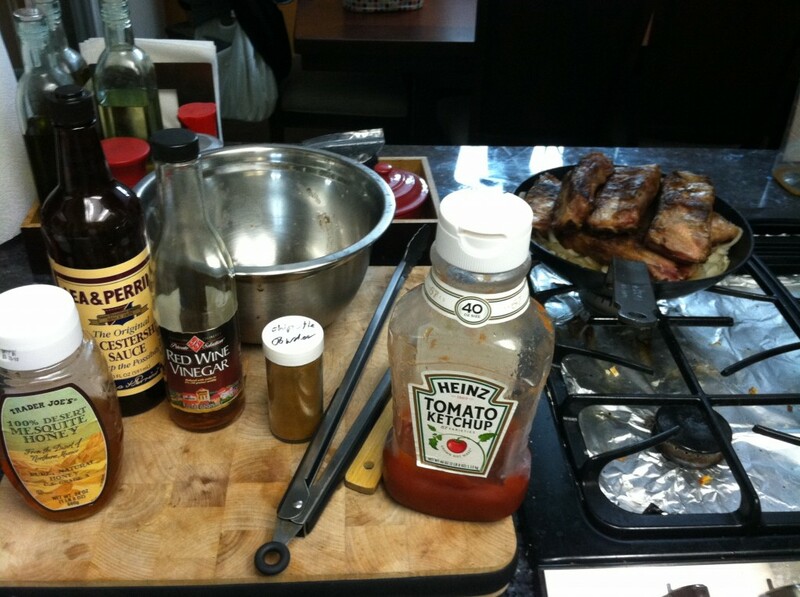 This is why all BBQ sauce has some kind of acid, usually in the form of a vinegar. 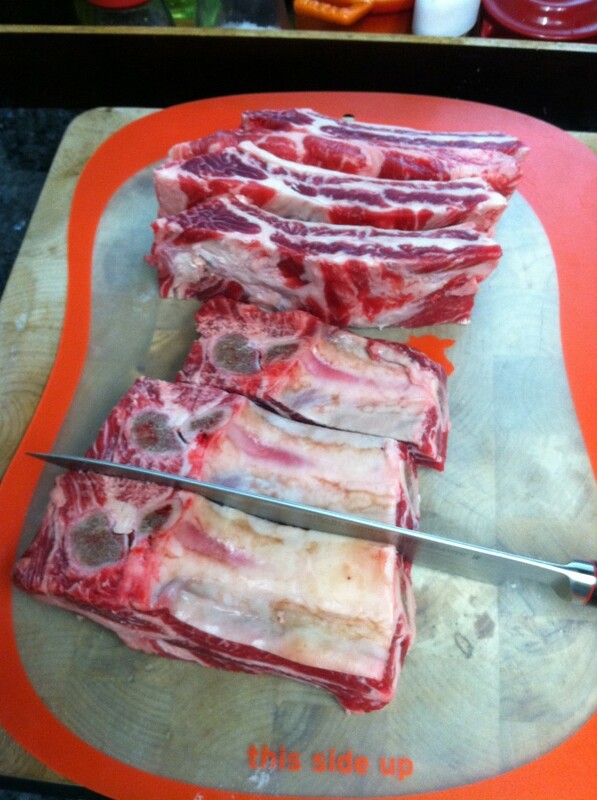 For my beef ribs I want the overall flavor to be well rounded and complement the beef. So I use Ketchup as my base (you could also use tomato paste but you would have to add some sugar because tomato paste is a bit sour/bitter on its own). I use red wine vinegar for my acid. To add some sweetness and to soften the acidity I add some honey. Then to add more flavor I add a little bit of Worcestershire sauce and some chipotle powder. You can play around with different combinations but just remember your braising liquid needs to taste good own its own or else it won’t taste good as a sauce. Just always remember the beef and onions will also add flavor so your sauce should be a little bit more sour that you want your sauce to be from the acid because after you braise the beef flavor and fat will balance out with the acid taste from the vinegar. I also added some chicken broth to add more flavor and to add more liquid because when you slow cook the liquid will slowly evaporate so you want enough liquid to keep the ribs wet during the entire cooking process. 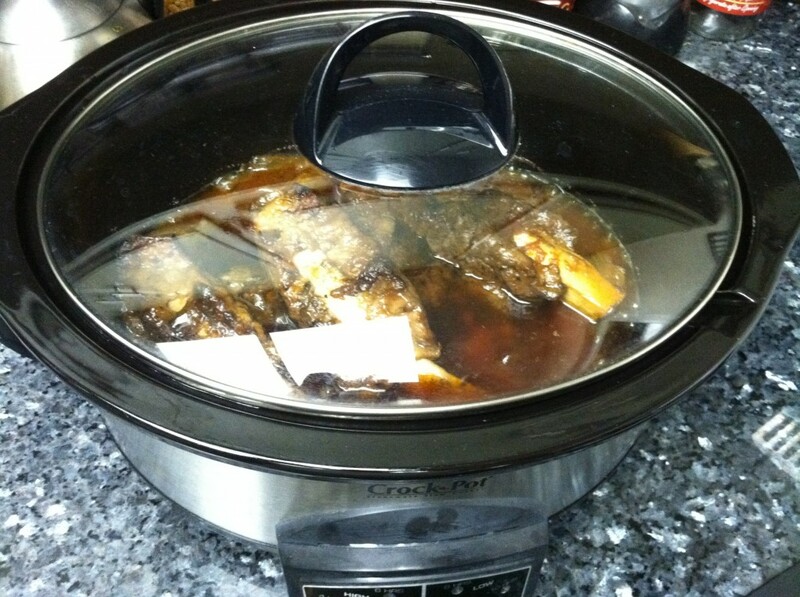 Add your braising liquid into the slow cooker then cover and cook on high for 6 hours. The ribs will look like the above image by the time they are done. Remove everything from the slow cooker once it is done and place everything into a glass container. let the ribs rest until room temperature then refrigerate over night or at least for two hours. When you are ready to eat, reheat the ribs by adding a layer of foil over the glass container and bake it for 20 minutes at 400 degrees. Why cook then cool down, then reheat the ribs you might ask? If you serve the ribs right after you cook them they will literally fall off the bone so fast you won’t even get them onto the plate without having them fall apart. The reason you want to let the meat cool down then reheat it is so the meat is super soft but not too soft to the point where it breaks apart. By looking the meat cool down you let the meat hold its shape better so you do not end up with a plate full of shredded up beef ribs. As usual, let the ribs sit for 10 – 15 minutes to get to room temperate before you reheat the ribs. during that time you should take out a cluster of asparagus and remove the rubber bands. 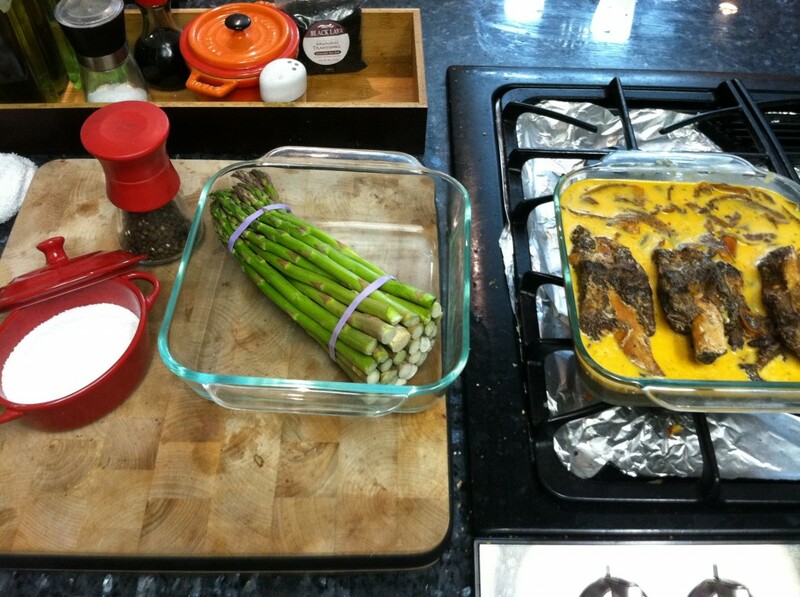 To prepare your asparagus just pick up one asparagus stem and bend it in half until is snaps. Wherever is snaps, line it up with the rest of your asparagus and cut them exactly where the first asparagus broke. The bottom half of the asparagus stems are no good to eat because they are very tough and fibrous. 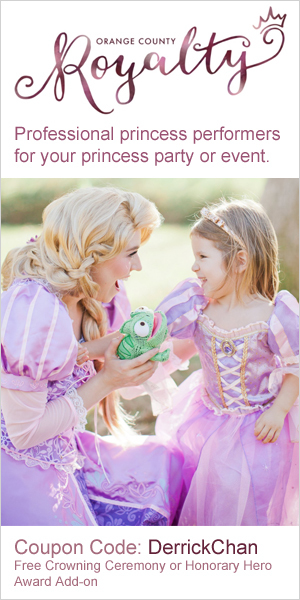 However, do not throw them away. What I do is I save them in a freezer bag for when I want to make asparagus soup. Once you cut your asparagus you will want to lightly cover them with cooking oil, then add kosher salt and fresh ground black pepper. 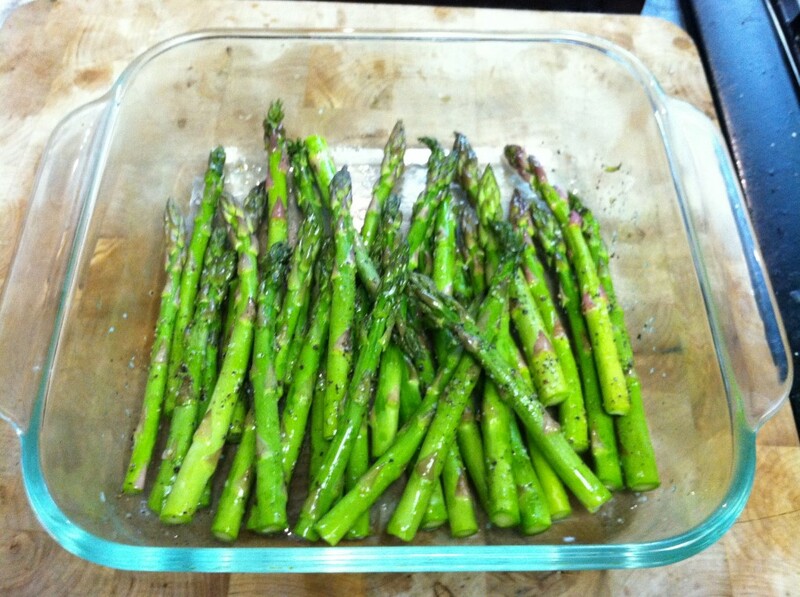 Bake your asparagus at 400 degrees for 25 – 30 minutes (25 if they are thin asparagus and 30 if they are thick). So after 5 – 10 minutes of baking, add the ribs into the oven as well so the asparagus and ribs can be ready to eat at the same time. During that time I usually make some white rice to eat with the meal. Once you are done just add some rice to a plate, put the grilled onions on top of the rice, then add your ribs and asparagus…. enjoy!